Note: The Canon EOS 30D has been replaced by the Canon EOS 40D. 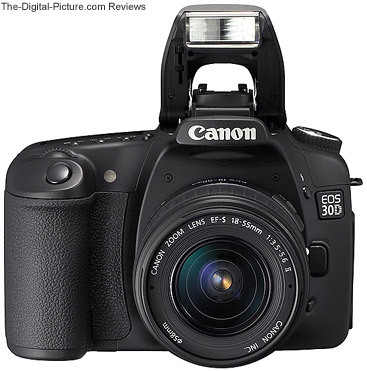 The Canon EOS 30D has the perfect price point and features including excellent image quality to become the favorite Digital SLR for a significant number of photographers - amateur and professional alike. An incremental upgrade from the hugely popular Canon EOS 20D, the 30D is destined to capture a great number of our generation's images. The 30D is shown above (and from above) with a Canon EF-S 17-85mm f/4-5.6 IS USM Lens mounted. According to Canon, the 20D "... was number 1 in its category virtually from start to finish over its 18-month market life, an outstanding accomplishment for any digital SLR in this highly competitive time. Its biggest rivals turned out to be other EOS cameras, first the Digital Rebel XT, which was priced below it, and then the more expensive EOS 5D." Now the 30D looks to take the place of this extremely successful Digital SLR body. The 30D shares many of the 20D's excellent specs and features including the same 8.2 MP CMOS sensor, DIGIC II Image processor, 5 fps fast continuous shooting, high-precision 9 point AF (Auto Focus) system, viewfinder and a durable magnesium alloy body. These are the same core components that delivered the excellent performance from and image quality of the EOS 20D. And the 30D is in fact delivering the exceptional image quality I have come to expect from Canon's latest generation DSLRs. I'm still looking for something of significance to complain about - maybe I can re-use the not-so-good auto white balance under incandescent-only lighting complaint. Sharing the 20D's sensor means also sharing its 1.6x Field of View Crop Factor (FOVCF). This factor enables the 30D to utilize the Canon EF-S Lenses including the announced-at-the-same-time Canon EF-S 17-55mm f/2.8 IS USM Lens. Be sure to read the FOVCF page for more information on the advantages/disadvantages of the 30D's 1.6x sensor. The following table illustrates sensor and viewfinder differences across the recent Canon Digital SLR models. The 30D utilizes Canon's latest 2.5-inch LCD monitor featuring 230,000 pixels, a much wider viewing angle and substantially improved visibility compared to its predecessor. The viewing angle has gone from 40° left/right of perpendicular and from 20° above/60° below to 170° total and evenly in both directions. This makes viewing position less critical - it is easier to show friends and clients images directly on the LCD. At the factory-set middle brightness setting, images are very hard to see in bright sunlight. 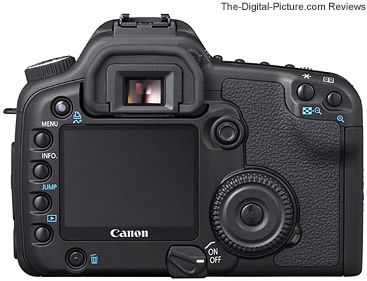 Canon has been using this LCD on the EOS 5D and the EOS 1D Mark II N. I like it - this is a nice upgrade. Other 30D LCD-related improvements include ... An improved jump function (jump by 100). The info screen has been enhanced with a new, switchable RGB histogram and now includes the image file size. No longer on the info screen are the AEB setting, processing parameters and image confirmation time. Image zoom is now available during image review. What I would like to see, however, is a single button press to Zoom-To-100% at the location of the active AF point. One last LCD-related addition function - A new in-camera-software-only auto image rotation now exists on the 30D. In addition to auto rotate on/off, the 30D can display auto rotated but vertically taken shots in non-rotated orientation on the LCD to make better use of the display. In other words, If you take a portrait-oriented shot with this new option enabled, The picture will fill the LCD and be upright when the camera is in the same orientation as the shot was taken in. Compatible software applications will display auto rotated shots in the proper orientation once transferred to a computer. I like this feature - I expect to see it in all subsequently released Canon Digital SLRs. The 30D provides more granularity in ISO settings by allowing 1/3-stop increments (vs. 1 stop increments in the 20D - from 100 to 1600 with ISO 3200 available. The ISO setting is now visible in the viewfinder while the ISO speed button is pressed. Both are nice improvements. An additional metering mode is now provided. The 30D shares the spot metering capabilities of the EOS-1 Series and EOS 5D. This is a very useful upgrade in my opinion - and leaves one less differentiator between the 30D and the more expensive bodies. The 30D incorporates Canon's Picture Style controls - just like Canon's other recently-released DSLRs. Canon has made a lot of talk about Picture Styles but I personally don't find them very useful. I select Neutral and adjust my settings during post-processing. But, everyone is different - and apparently many like this simple-to-use feature (or at least Canon thinks so). Users intending to do no post-processing may want to select the "Standard" style. What I do like is that Canon is standardizing the imaging parameters across its DSLR line. With reduced energy consumption, the 30D should be good for roughly 10% more shots per battery charge. I was seeing approximately 600 shots from a fully-charged BP-511A on the 20D, so the 30D should deliver in the upper 600 range from the same battery. My battery is still showing full charge with over 400 shots on it. Also good is a new 4-step battery level display. 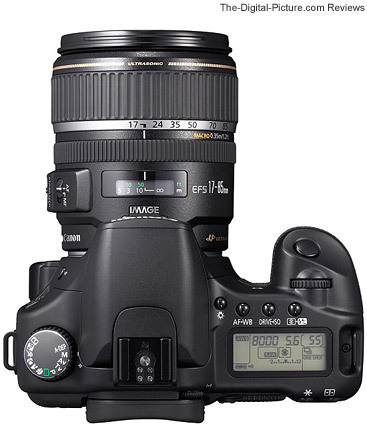 The 30D is shown above with a Canon EF-S 17-85mm f/4-5.6 IS USM Lens mounted. Like the 5D, the 30D has a professional-grade shutter rated to approximately 100,000 cycles. While most 20Ds will not see the 50,000 shutter actuations its shutter is rated for, serious amateurs and pros will appreciate the double-length rated shutter life on the 30D. By the way, this is referring to the expected life of the shutter only - the shutter can be replaced by Canon Service. It seems like the 20D powers on immediately, but the 30D is .05 seconds faster with a 0.15-second startup time. To wake the 30D on from Auto Power Off mode, pressing the Playback button, the Menu button or the AE Lock button will now also perform this task just as pressing the shutter button halfway did and still does. "The multicontroller’s operation and diagonal scrolling have been improved with new firmware and a re-shaped controller" on the [30D]. I think the joystick-like multicontroller on the 20D was a great idea, but I found it an effort to use properly. The results of this improvement are nice - I find the multicontroller easier to use - or I'm just getting more competent. Uses for the multicontroller include AF point selection - push the multicontroller in the direction you want the active AF point to move or press the multicontroller to select the center AF point. In addition, the multicontroller is used to navigate zoomed images in review mode. Maybe Canon should add some games to use the multicontroller with. The 30D features improved folder management with up to 9,999 images in each folder and file numbering with manual reset. Manual reset could be performed in the past, but required a procedure that included switching continuous numbering off and back on again. Depending on how you are transferring the files to a computer, the increase in shots per folder may be greatly appreciated. The 30D has one new custom function - C.Fn-17, "Magnified View". With CF 17 set to 0, the 30D functions like the 20D - image zoom is only available during image playback. Set to 1, image zoom is available during image review immediately after the shot (Hold the infamous "Print" button and press "+"). The downside to this mode is that the AF Selector and AE Lock buttons are not available for their shooting tasks. A new Custom Function 02 setting provides auto noise reduction for long exposures. You can read more about this in the 30D white paper linked at the end of this review. Like the 5D and 1-Series cameras, the 30D retains AE/AF lock in One Shot mode until the shutter release is allowed to return completely. Subsequent shots using the same AE and AF settings can be taken by allowing the shutter release to travel half way up and then depressing the shutter release again. 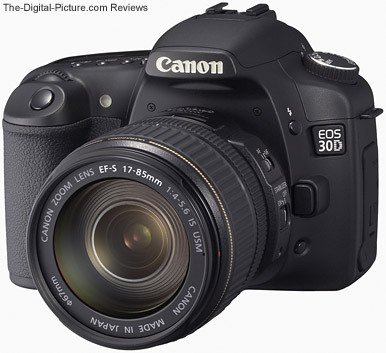 The Canon EOS 30D incorporates some physical design changes in addition to the larger LCD "... to move the EOS 30D in the direction of the EOS 5D." "Shapes around the flash head and lens mount have been changed subtly to suggest Canon’s upper-range models. The mode dial now has a metallic finish. The grip below the shutter button has been extended for better purchase with the middle fingers and improved overall handling. A new groove where the middle finger falls improves comfort and security. The body is 2mm thicker than the EOS 20D’s, also enhancing comfort and security. Indented surrounds have been added to the row of four buttons on the back of the camera and the Delete key has been given its own location. Like the EOS 20D, the 30D is compact, solid, elegant, durable and purposeful. It is easy to carry and a delight to hold and use." The first thing I noticed when picking up the 30D was the grippier surface on the rubber grip. The reshaped grip is nice, but just slightly different than the 20D. The 30D grip is much nicer for me to hold than the Rebel XT, but the camera is noticeably larger as well. I still like the 5D grip better. The 30D feels very solid and the overall appearance is very attractive - a modern design. Because of the design changes, the 30D differs from the 20D very slightly in size and weight. The table below compares the size and weight of some current-at-this-time Canon Digital SLR cameras. Canon's white paper details many other small internal changes made to the 30D. I'll note here that the maximum capacity CompactFlash card the 30D will use is 8 GB. The 30D shares battery grip compatibility with the 20D - both utilizing the Canon BG-E2 Battery Grip. Although errors are unusual on Canon's Digital SLRs, they do happen occasionally. New "Error code readout on back screen together with countermeasures help" will save some research time in identifying what is wrong. I haven't been able to activate this feature yet (and hope to never do so). While a majority of 20D users are not using the wireless transfer feature (using the accessory WFT-E1A), a new display for image transfer failure will be valued by those using it. The 30D's built-in flash is great for shadow-fill and snapshots. New for the 30D is an upgraded flash to match the 100,000 shutter cycle durability. A new FEL (Flash Exposure Lock) icon is displayed in the viewfinder. Like the Canon EOS 5D, the 30D now has the infamous Print button. I suppose some people use it, but this button gains some new functionality this time around. On the 30D, this button can be used for direct image transfer when the camera is connected to a computer via a USB connection. Although I use a high speed card reader for transferring images, I can see some people liking this image transfer method. The 30D is shown above with the pop-up flash popped-up and with a Canon EF-S 18-55mm f/3.5-5.6 Lens mounted. Canon's included DPP (Digital Photo Professional) software v2.1 supports cameras from the new 30D to the old Canon EOS D30 and beyond. Note: This might be a good time to sell that old D30 at an auction as name similarity may cause the value to go up. :) Anyway, everyone using a Canon Digital SLR gets an upgrade with each new version of DPP. The big thing we get this time is noise reduction on RAW conversion. This is a feature I had been asking for - one that can eliminate Photoshop from the workflow on some of my images. Unfortunately, Canon placed this feature in the global preferences. Why there Canon?! A Tone Curve Assist function has some promise "... for the automatic adjustment of failed shots." Some print enhancements have also been included. I am finding many unadvertised small fixes and changes in v2.1. At this date, there are a lot of RAW conversion software applications available. While many are showing promise, I continue to use DPP because I like its conversion quality best. And it does hurt anything that Canon gives us this software with the camera. Canon's white paper details other included software and their enhancements. The one change from the 20D that everyone can like is a lower introductory price. The big decision - which Digital SLR is for you? If your budget is tight, you want a compact Digital SLR, do not need a fast frame rate and do not need the higher grade build quality and additional features of the 30D, the Digital Rebel XT/350D is probably the choice for you. It is a huge leap up from most of the point and shoot digicams available - and is an exceptional value. If you need a full frame sensor and/or a higher megapixel count but do not need a higher frame rate, look at the Canon 5D. There is a noticeable increase in available detail in a jump from 8.2 to 12.8 megapixels. If you are looking for the ultimate sports camera, need very rugged build quality and/or need weather sealing, the Canon EOS-1D Mark II N is likely your best choice. The Canon 1-Series Digital SLR Cameras represent the ultimate in features and performance. 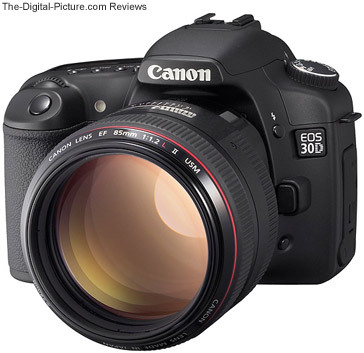 For everyone else (a very high percentage of the market), the Canon EOS 30D delivers the very high performance at a modest cost they are looking for. Many serious amateurs and professionals will be choosing this body as their primary camera. Many others will be choosing the 30D as their backup camera (I am a member of this group). If you have an older Digital SLR or one of the Digital Rebel models, this is a more substantial upgrade - One that should be considered carefully.